More than 20 provinces have responded to the central government's call to action for 2019 in the face of what some Chinese media dubbed the country's "worst-ever employment season." After the State Council released guideline to support employment in December, two-thirds of China's provinces and municipalities were reported by media to have implemented policies for employment. The policies came as Chinese social media reported that China's largest medical equipment manufacturer was dropping 254 of 485 college graduates from being hired upon graduating in July. Mindray Medical International's decision not to hire the 254 sparked widespread concern about a changing employment climate during an economic slowdown. Some of the 254 students told the Global Times on Monday that they signed contracts with Mindray in September, but were refused on December 28 or 29. The reason given for their dismissal was that the Shenzhen-based company was going through a business adjustment and these graduates could not fit into their short-term plans. "How could they make the judgment when I have not even officially started working for them?" Liu Yuchen, one of these students, told the Global Times on Monday. The Mindray firings followed social media articles in December alleging that Chinese internet companies were also slashing jobs, including online travel app Qunar, group-buying website Meituan-Dianping and Zhihu, a Quora-like question-and-answer website. Most companies denied they were struggling with mass layoffs and offered a standard explanation that they were optimizing their business structure. Meituan-dianping said that there were "about 2,000 fresh graduates working in Meituan. The hiring adjustments are within the normal range." The food delivery, consumer product and retail services firm reportedly laid off many 2018 graduates, without notice. In the past few weeks, Chinese mainland media have coined and repeatedly used the phrase "worst-ever employment season" to convey 2019 job concerns amid a slowing economy and trade frictions with the US. 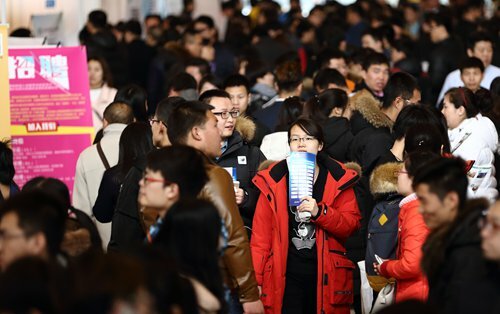 Employment demand dropped 20.79 percent quarter-to-quarter in the third quarter of 2018 across all industries, according to a report sent on Sunday to the Global Times by jobs website zhaopin.com. It was the first time employment demand declined in the third quarter since 2011, the report said. Employment demand in import-export trade industries shrunk 53 percent in the third quarter of 2018 and that same measure dropped two percent in the first quarter and 13 percent in the second, the report said. Employment demand in the Chinese mainland's internet sector plunged 51 percent in the third quarter, the second negative growth of three quarters and significantly worse than the contraction in other industries, according to the report. Meanwhile, the number of new Chinese undergraduates is estimated to reach 8.34 million in 2019, 140,000 more than 2018, or about one and half times the population of Singapore. The number of applicants for postgraduate examinations reached a record high of 2.9 million in 2019, an increase of 21 percent compared to last year, China News Service reported in December 2018. The top motivation for students to pursue postgraduate studies is to gain an edge in an increasingly competitive jobs market, the report said. Cong Yi, a professor at the Tianjin University of Finance and Economics, told the Global Times on Monday that a deeper employment problem is the ongoing industrial structure upgrading in China. A large number of workers in traditional industries were laid off as a result of the fourth industrial revolution, which is the reason why the Chinese government has been taken action to help Chinese workers and enterprises to pull through the revolution, Cong noted. The government will prioritize stable employment and job creation while implementing a more proactive employment policy, the State Council's December guideline said. More government-subsidized training will be conducted to provide the jobless with vocational skills, while employment services and support policies will be given to laid-off workers. Laid-off workers in regions with employment difficulties will be provided free office space to start their own businesses, the guideline said. The Jiangsu provincial government said it plans to help 100,000 young people find jobs or internships in three years starting January 1, 2019, the People's Daily website people.cn report reported in December 2018. The province has targeted helping 1.2 million people find jobs in urban areas, which is "a very tough mission," Dai Yuanhu, director of the Department of Human Resources and Social Security of Jiangsu Province, was quoted as saying by people.cn on Friday. The unemployment rate of Jiangsu in 2018 stabilized at 4.4 percent. About 562,000 college students will graduate in the province in 2019, the Friday report said.